This blog site represents the work of many people – family, friends, Marines, National League of POW/MIA Families, the Joint POW/MIA Accounting Command (JPAC) – now integrated into the newly formed Defense POW/MIA Accounting Agency (DPAA) -- and others within the U.S. Government and elsewhere who believe that bringing home our MIAs is the fulfillment of a solemn promise that we make to our men and women in uniform. We invite you to follow our collective journey in the quest to bring Jerry home. 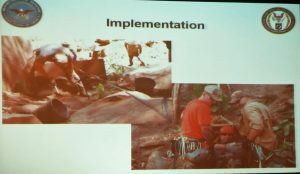 I captured this image during a PPT presentation at the 2016 Family League meeting, demonstrating the effort required to locate the remains of MIAs from downed aircraft in the mountainous terrain of Southeast Asia. Nowadays many searches involve our unaccounted-for service members killed in high-speed crashes, such as the F-4 Phantom piloted by my first husband, Capt. Jerry Zimmer, USMC. This image is not related to Jerry’s case, nor do I know when, where or whose case was involved. Privacy rights are always paramount out of respect for the families. I rarely forget August 29th, as the day that Jerry was killed-in-action during the Vietnam War, when his F-4 Phantom was shot down in 1969, over the Que Son Mountains of South Vietnam. This year the 29th has special significance. Not only will it be the 48th Anniversary of Jerry’s death, but weather permitting, teams from the Defense POW/MIA Accounting Agency (DPAA) and the Vietnamese Office for Seeking Missing Persons (VNOSMP) are camping out on the mountainside of Jerry’s crash site in Quang Nam Province, conducting an 8-day survey, from Aug 25 – Sept 2,2017. The importance of this survey cannot be minimized, not only for its danger, but its outcome. 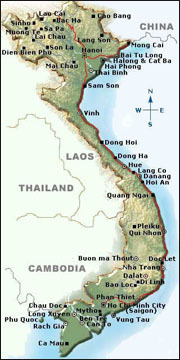 Due to the size of the crash site, DPAA and predecessors have conducted several excavation phases, as is typical of many jet crashes in mountainous areas of Southeast Asia. This survey will cover the last area of the site – on the side of the mountain with the most dangerous terrain, requiring certified mountaineers and other specialists. If the survey produces compelling evidence, such as human remains – even the slightest amount — then DPAA’s anthropologists could recommend another excavation in the future; however, if nothing of significance is found, then I think Jerry’s case will be closed. As most can imagine, I am praying for a positive outcome – maybe a miracle, but I also realize that the odds are not in my favor. While excavations are considered the most intense and perhaps desirable part of the process in the search for remains, I think that the type of survey being conducted at Jerry’s site is unique and truly demonstrates what it takes to recover remains from jets like the F-4. The low-hanging fruit was picked years ago, and in recent years the concentration has been on the aircraft downed in mountainous areas of Southeast Asia. As difficult as it is to believe, DPAA, VNOSMP and predecessor groups have had success in finding remains in the crevices and wash basins of mountainous sites over the years. It is simply mindboggling. The investigation team is based on the mountain during the survey. The VNOSMP conducted all the preparations for the base camp and flew supplies in an Mi-17 to the site in advance of the US team’s arrival. Leading the survey will be two anthropologists and two mountaineers, as well as the rest of the team, all of whom have specialties. Please stay connected, and I will post an update when available. Thanks very much for your support. L-R: Col. Hays Parks & Col. Bob Lange, both retired Marines from Bravo Co., TBS, 1-67, taking part in the wreath laying portion of the ceremony. The memorial plaque is to the immediate left of the wreath. Capt. Andres (Andy) Vaart, USNR, ret., is another one of Bravo Company’s devotees. Andy told the families and friends of those listed on the plaque that he wanted to acknowledge the suffering of those left behind – it was a beautiful tribute, directed at families, who endure but never forget. At the podium is Brig. 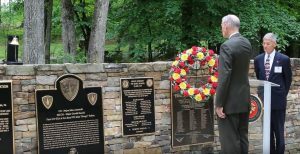 Gen. Mike Wholley, USMC, ret, reciting the names of each Marine listed on the Memorial Plaque, while Lt. Col. Hon K. Lee, USMCR, ret., tolled the Bell of Honor as a sign of respect for each fallen hero. During the playing of taps, an active duty Marine in his Combat Utility Uniform stands at attention and salutes, while Col. Parks, also stands at attention with his hand over his heart in keeping with military tradition. 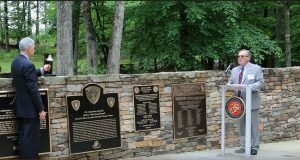 Many thanks to the Marines of Bravo Company, TBS 1-67, for honoring the unit’s fallen warriors with a special plaque. Listed are the names of those who lost their lives in the Vietnam War, one of which is my former husband, Capt. Jerry A. Zimmer. 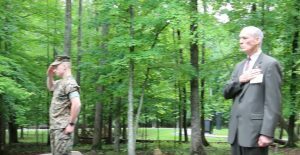 Inspired by Col. Hays Parks, the plaque soon became a Bravo Company project with everyone contributing in some way to its success. 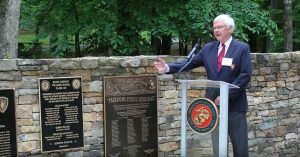 On May 24, 2017, approximately 50 family members, special guests and former Bravo Company Marines gathered at the National Marine Corps Museum in Quantico, VA, to attend the plaque dedication ceremony.